JUBA, May 26 2012 (IPS) - South Sudan is losing its forests. And with no unified policy to deal with the situation the government is at odds, with one ministry saying that the loss of forests is a necessity for farming and another warning of the dire environmental consequences if this continues unchecked. Several decades of war, during which the country’s environment was neglected, coupled with post- independence challenges and tension with Sudan, have resulted in environmental degradation here. And it is largely caused by rampant deforestation. Isaac Woja, an agriculturalist and natural resources management expert, said the rate of deforestation was of concern. “The rate at which people are cutting trees is worrying. If this trend continues future generations are going to suffer. South Sudan may become a desert like what you see in the north,” he told IPS. While there is no information on the exact number of forests in the country, according to 2009 figures from the Ministry of Agriculture and Forestry, forests and woodlands cover an estimated 29 percent of the land area in South Sudan or 191,667 square kilometres. South Sudan’s rapid deforestation is being partially led by the country’s inability to provide rural and urban populations with access to reliable electricity. According to the Directorate of Forestry in the Ministry of Agriculture, nearly 99 percent of South Sudan’s eight million people use firewood or charcoal as their main source of energy. For many charcoal is the cheapest source of energy and is likely to remain the primary energy source unless radical steps are taken to introduce alternative forms of energy. Director of Forestry in Central Equatorial State Gideon Samuel said that in the absence of alternative energy sources, charcoal burning is impossible to ban. "We are finding it a very difficult thing to control. So we think if an alternative is was found to replace charcoal as a source of energy, I think that would be good for us," he said. Samuel added that the country had a number of laws regulating the use and production of charcoal. One of which was that charcoal could only be produced from trees that were felled when clearing land for agriculture. However, there were not enough resources to police this. Samuel said his directorate has no capacity to control the illegal fellers. "The restriction has not even taken impact because when someone is in need, they do whatever they want. 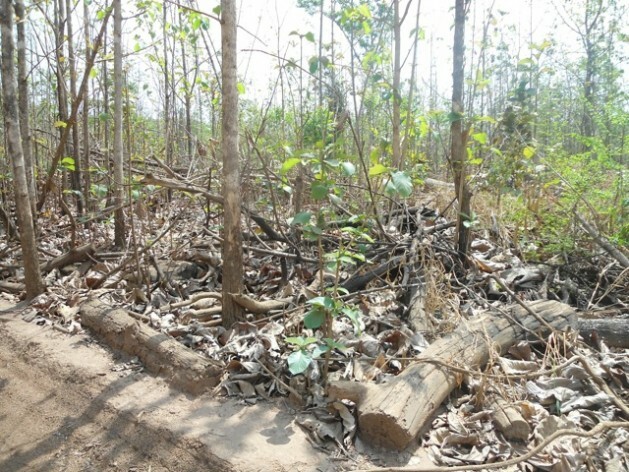 And our capacity as forestry officials is very low because we have few forest guards to control feeling of trees for charcoal production," he explained. In addition, many villagers are turning to charcoal burning to earn a living. Generino Akita, a local farmer in Juba county who started making charcoal a couple of years ago, said his workers cut more than 100 trees a week to be able to produce at least 50 bags of charcoal. Four years ago Marko Ladu was a farmer before he ventured into the charcoal production, said he would not stop cutting down trees as charcoal production was his only source of income. "I have six children. I’m trying to survive and feed my children here. There are no jobs. What am I supposed to do?" he asked. A study conducted in 2010 by the United Nations Food and Agricultural Organization (FAO), dubbed the Forest Resources Assessment, estimated that a high rate of up to 2,776 square kilometres of forests and other wooded land were being lost annually in South Sudan. The cutting down of forests to clear land for cultivation started in 2005 after the signing of the Comprehensive Peace Agreement, which formally ended the recent civil war (from 1983 to 2005) between the then south and north Sudan. However, deforestation has worsened since independence as South Sudanese who have been living as Internally Displaced Persons in Sudan began returning. According to the U.N. in the last 18 months alone 350,000 people have returned from Sudan. In addition, an unspecified number of people have also returned from neighbouring countries following South Sudan’s independence on Jul. 9. South Sudan’s government has allocated the returnees land to settle on, including in areas near forests. Many have resorted to farming as a way to earn a living, and have begun clearing nearby woodlands for cultivation. This has been occurring mostly in Eastern, Western and Central Equatoria states, in the south of the country, and to a smaller extent in Western and Northern Bahr al Ghazal states, in the country’s north. These states have the most fertile arable land in South Sudan. In an interview with IPS, the director general in South Sudan’s Environment Ministry, Victor Wurda Lotome, warned that although investing in agriculture would help the country’s economy, if the environmental risks associated with mechanised, commercial agriculture are not considered, the damage to the environment could outweigh the financial benefits. “Much as we are eager to increase food production and ensure food security in South Sudan, and much as we want to promote agricultural investments, it is important to squarely address environmental sustainability. There must be safety nets to prevent vulnerable people from the consequences of drought resulting from environmental degradation,”¬ said George Okech, South Sudan Country Director for the FAO. Woja explained how a drought could result from deforesation: “Forests also help in the making of rain. Deforestation means that in the years to come the affected areas will receive less or no rainfall at all.” However, South Sudan’s Minister of Agriculture and Forestry Betty Achan Ogwaro said it was impossible for farmers in the greater Equatoria region, which contains a large number of woodlands and forests, to cultivate land without cutting down any trees. Ogwaro said South Sudan needed to use tractors to boost food production, adding that tractors could only be used if farmlands were cleared of trees. “People are asking for tractors. That is why we are saying that you have to cut some trees in order for you to be able to use a tractor on your farm,” she said. Woja said smallholder farmers in South Sudan currently use on average 0.2 to 0.4 hectares of land to cultivate crops for home consumption but with the increase in the country’s population this number would rise. “Although the total area under cultivation in South Sudan is still low, it is expected to increase proportionally with the increasing population. This means we will be seeing more forests being cleared,” Woja said. He added that if the land was not farmed correctly, the soil could be negatively affected. “The other thing with mechanised agriculture is also that if the tractor operators are not knowledgeable on how to plough they could end up establishing a hard layer, which could stop water from entering the soil,” Woja explained. But returnees say they have no other option but to cut down forests as their ancestral land, which is communally owned, has been over used and can no longer yield good harvests. And many feel they can cut down the trees because “the forests belong to nobody”. “My grandparents lived and farmed on this same land. My parents also brought us up here on this land. But the land has become infertile,” said Michael Lodiong who returned to Kajokeji county in Central Equatoria state in 2006 after spending nearly 20 years in exile in neighbouring Uganda. “I realised that if I expected to get any good harvest, the only solution was to cultivate virgin land. That is why I decided to relocate to A’baya forest,” he added. A’baya forest is in Kajokeji county in Central Equatoria state. Lodiong said when he farmed his ancestral land he barely harvested a one 100-kilogramme sack of maize. “Since I moved to this place, I now harvest more than 15 sacks of maize from under two acres,” he said. Loding’s sentiments were shared by Gordon Sebit, who returned to Lainya county in Central Equatoria state in 2007. But he did not return to his home village. Instead he relocated in Dongoro forest in the same state. “Of course people are saying we should not cut down trees but they must know that we cannot eat trees. We can only eat food crops. We are doing this in order to produce food,” he said. In addition, commercial agriculture has expanded in all parts of the country including Western, Eastern and Central Equatoria states, as well as Northern and Western Bahr al Ghazal states. And here deforestation has been driven by foreign companies and government. A consultant at the Ministry of Agriculture and Forestry, who spoke on the condition of anonymity, said that since 2007 to date foreign companies, government and individuals have acquired at least 26,400 square kilometres of land for agriculture and bio fuels projects. This, he told IPS, was a considerable amount of land.